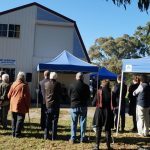 On Saturday, 27 May 2017, Hon Hieu Van Le AC, Governor of South Australia, officially opened the new base for Books for Lesotho at The Barn, Pasadena High School (Adelaide). 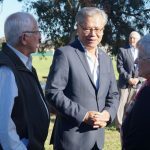 He and Mrs Lan Le met David Linn (Chairman of the Board), Liz Linn (Member of the Board), and Wendy House (Principal of Pasadena High School) before addressing the invited guests. 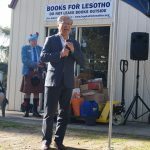 In his address Mr Le referred to the 10-year history of the project which has now delivered over 102,000 books to some 60 primary and secondary schools and about 10 organisations working with disadvantaged children in Lesotho. Lesotho is totally surrounded by South Africa, has a population of about 2,000,000 and is smaller than Tasmania. Me Le pointed out that with 2,500 primary school and 250 secondary schools, many without resources beyond basic government supply, there was a big challenge ahead for Books for Lesotho. Key people in Lesotho have declared this a “nation building project” whereby children are being given the opportunity to learn to read for pleasure and from that base increase their educational and work opportunities. 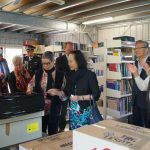 Mr and Mrs Le then inspected the facility were books are received from around Australia, sorted and packed for despatch to local partners in Lesotho. Morning tea was provided by staff and students of the school.